To improve overall functional safety of various applications to global safety standards and reduce manual inspection and maintenance, ABB has launched what is reported to be the world’s first safety PLC with integrated condition monitoring. Fail-safe condition monitoring complements standard condition monitoring, enabling many more applications to feature functional safety on-board. This opens up the ability to safely monitor the brake status of automated guided vehicles, trains or mobile machines using measured vibration levels. Another application is the safe monitoring of excessive vibrations experienced by centrifuges or wind turbines. For instance, precise measurement of vibration signals with a wide range of frequencies up to 20 kHz can be safely supervised, thereby avoiding spontaneous critical failures like wind turbine or centrifuge collapse. Also, vibration-based monitoring of brakes, for instance on mobile machines, enables longer intervals between inspections, as fail-safe supervision provides more precise data on the status of safety-critical machine parts. Furthermore, fail-safe condition monitoring, together with predictive maintenance, provides an early warning that prevents machine breakdown and the costly consequences of stopping production. For example, safely-limited speed mode activation can be implemented to reduce downtimes based on feedback from the fail-safe condition monitoring instead of safe emergency stop, whenever it is permitted in the application. The solution uses ABB’s AC500-S Safety PLC, the modular architecture of which enables the combination of the PLC’s fail-safe and condition monitoring units. Safety functions up to SIL CL 2 (IEC 62061), SIL2 (IEC 61511) and PL d (ISO 13849-1) can be implemented with fail-safe condition monitoring. The expected analogue safety signal’s profile can be saved within the safety PLC’s 120 kB flash memory. The measured signals connected to the AC500’s condition monitoring module channels can then be compared with the pre-defined signal profile saved on the safety PLC. If the difference exceeds the allowed range, then the safety reaction is triggered. Using SM560-S-FD-4 Safety CPU and CM589-PNIO-4 PROFINET IO device ensures that the safe evaluation result can be exchanged from one fail-safe condition monitoring system to multiple safety controllers, including third party, using PROFINET/PROFIsafe. This enables implementation of the full machine emergency stop or plant-wide emergency stop function, whenever required. 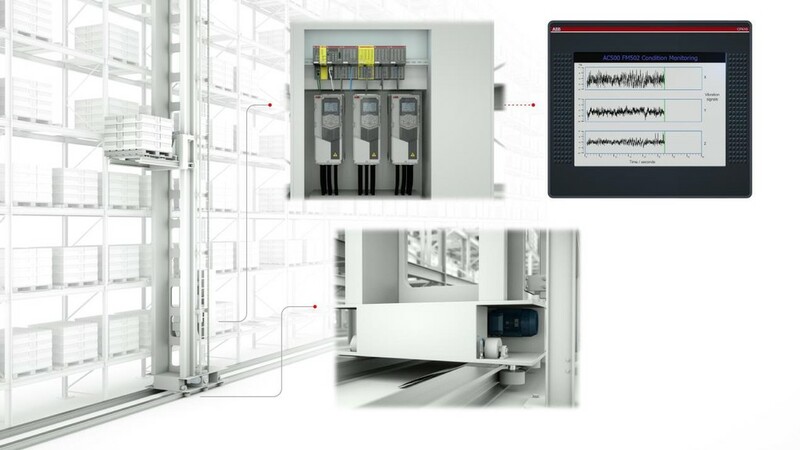 In general, condition monitoring using ABB’s AC500 PLC, provides easy integration with all kinds of machinery systems, enabling precise management of an application’s real-time condition. This provides more efficient machines, predictable performance and significant reduction in maintenance costs. Whether stand-alone condition monitoring or integrated into a machine or process control, the AC500 is suited to build optimised, self-analysing automation solutions that simultaneously perform condition monitoring, control, protection, safety and data logger functions with one controller.